The Saturday Creative is all about featuring busy professionals who honor their creative impulses and passions outside of their more conventional careers. This week’s contribution comes fromthe busy, brilliant and open-hearted Chaz Franke. Chaz is a professor and fellow psychotherapist who specializes in working with trauma survivors through the non-profit sector in St. Louise. 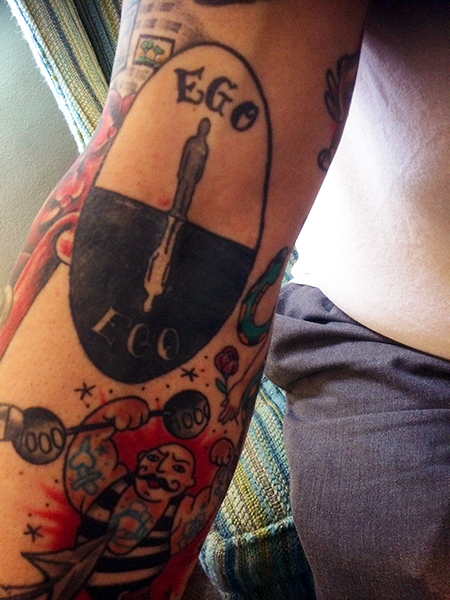 Chaz also gives trainings and webinars on self-care and self-compassion, and he has a deep passion for.... Tattoo art. Yep, but we'll get to that in a bit. Back to his 'official' job. Chaz has dedicated years and years to the art of listening. When he submitted toThe Saturday Creative, I was especially taken aback by his clear love of the work: "Therapy is such an amazing opportunity. All I ever wanted was to be someone who can create a safe place for people to tell their story. It is so humbling to hear these incredible people push themselves to get better everyday. They take risks in therapy that they've never taken in their life and it leaves me in awe. I'm so fortunate to do something everyday where I can just bear witness to the strengths of others." Now time to get into that other passion of Mr. Franke's, tattoo art. Chaz uses his body as a canvas to reflect "symbolism and meaning making." Chaz works regularly with the incredibly gifted tattoo artist, Amanda Pepper, and each image has its own interpretation. Thanks so much to Chaz for this special contribution, the tattoos below are a little something called awesome. There are few things I love more than seeing the way people channel their own unique creativity — do you have a creative way of cooking something, styling something, writing, painting, getting your kids to brush their teeth?…There are endless ways to be creative, and the world is unequivocally a better place when those gifts are shared. If you'd like to contribute to the Saturday Creative, I would love to feature you. Just shoot me an email. 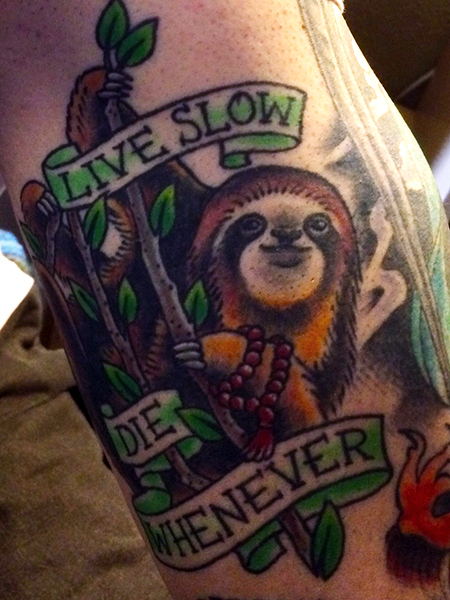 My sloth: I love the representation of a sloth as something that simply is. Doesn't do much, doesn't get bothered by much. No natural predators and very little concern. Heart Turning Into Water: I read about this as an alchemical reference discussed by Jung. 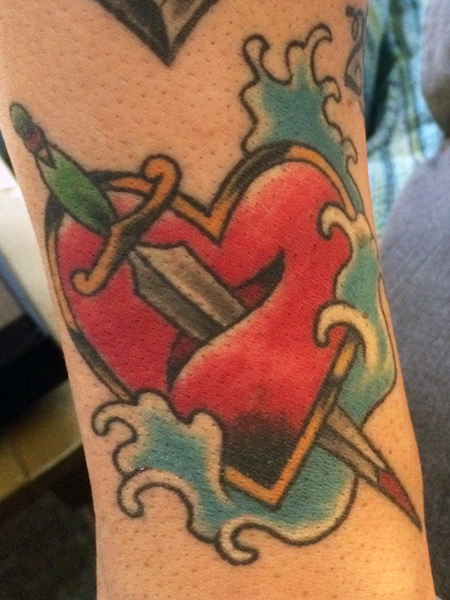 Turning the heart into water represents the opportunity to ensure that I never get too rigid. Turning the heart into water means that I refuse to treat things as if they are concrete. My heart should always be prepared to soften. Ego tattoo: this is a very simple representation of the shadow theory by Jung. Pug therapist: we have a rescue pug that was born blind. She's the best therapist I've ever seen. She is the picture of resiliency and all she wants is to simply sit with you. (I don't have a pic for this but I thought it was a really sweet description, and since the pug is blind, not having a pic is kind of fitting). 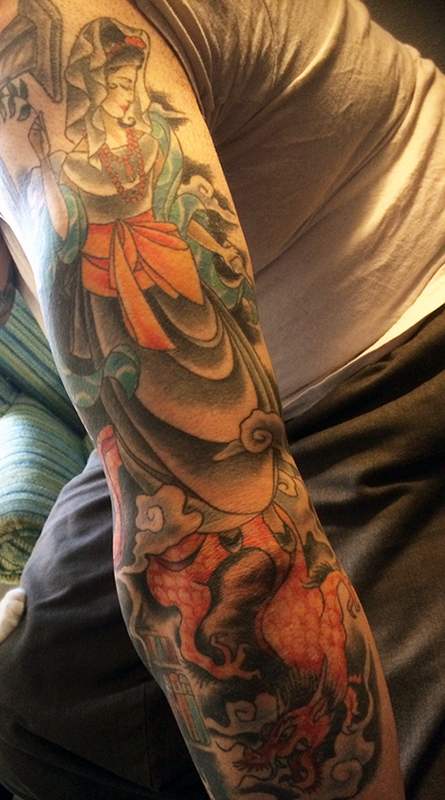 Quan Yin: My largest tattoo is full representation of the the Buddhist goddess of compassion. She is a bodhisattva. A being whose goal it is to stay on earth until all suffering has ended. 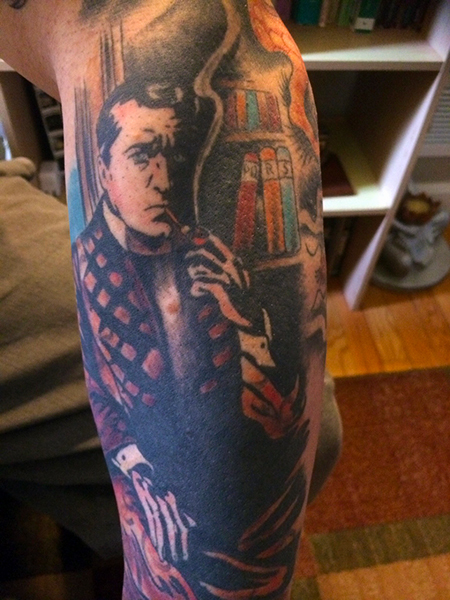 Sherlock Holmes : Holmes is where I learned zen. Holmes refuses to simply focus on the same thing as everyone else. He embodies the beginners mind. He always approaches a situation with a true appreciation for detail and keeps a nonjudgmental attitude. Thanks again for your contribution, Chaz!